Dover, NH (April 9, 2019) - The Homewood Suites by Hilton Dover has recently completed a $2 million renovation project to its 88-room, all-suite, hotel property. The project was led by Granite State Contract Furnishings and included a complete refresh to the property, both inside and out. All the guest rooms, hotel lobby, guest lodge, and outdoor patio and grill area have been recently renovated. Owned and operated by Lafrance Hospitality, the Homewood Suites by Hilton Dover appeals to guests who want to travel on their own terms. Homewood Suites by Hilton Dover offers guests all the comforts of home, whether they are traveling for work or enjoying a well-earned getaway. The hotel provides a complement of services and brand amenities. You can take advantage of 88 all-suite guest rooms, all of which include kitchens fully equipped with microwaves and full-size refrigerators, indoor pool and spa, 24-hour fitness center, meeting space, complimentary breakfast daily, and evening socials every Monday – Thursday. With a new look based on the Homewood Suites Take Flight initiative, guests will feel refreshed as soon as they are welcomed onto the property by the renovated lobby and reception area. The renovations continue through the lodge and into the guest rooms where the guests will feel right at home with a comfortable new look. The property also renovated their outdoor patio and grill area, a great spot for some fresh air. The Homewood Suites Take Flight initiative focuses on the functionality and ambience of shared spaces and in- suite enhancements to increase productivity and comfort for the way guests live and work today. “We are very excited about the results of our recent renovations. The updated look gives our property a facelift that we cannot wait for our guests and community to experience for themselves.” said Molly Mulholland, Hotel General Manager. Homewood Suites by Hilton Dover is also part of Hilton Honors®, the award-winning guest-loyalty program for Hilton’s 17 distinct hotel brands. Hilton Honors members who book directly through preferred Hilton channels have access to instant benefits, including a flexible payment slider that allows members to choose nearly any combination of Points and money to book a stay, an exclusive member discount that can’t be found anywhere else and free standard Wi-Fi. Members also enjoy popular digital tools available exclusively through the industry-leading Hilton Honors mobile app, where Hilton Honors members can check-in, choose their room and access their room using a Digital Key. 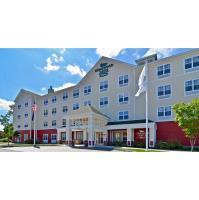 Homewood Suites by Hilton Dover is located at 21 Members Way, Dover, NH 03820. For reservations, visit www.dovernh.homewoodsuites.com or call the hotel directly at (603) 516-0929. About Homewood Suites by Hilton Homewood Suites by Hilton, Hilton’s upscale, all-suite, extended-stay hotel brand with more than 480 locations in the United States, Mexico, and Canada, is an award-winning leader. The first choice for guests seeking comfortable accommodations when traveling for an extended or quick overnight stay, Homewood Suites offers inviting, generous suites featuring separate living and sleeping areas, and fully-equipped kitchens with full-size refrigerators. Additional value-driven essentials include complimentary internet, a daily full hot breakfast, and complimentary evening socials every Monday - Thursday. Hilton Honors members who book directly through preferred Hilton channels have access to instant benefits, including a flexible payment slider that allows members to choose nearly any combination of Points and money to book a stay, an exclusive member discount that can’t be found anywhere else, free standard WiFi, and digital amenities like digital check-in with room selection and Digital Key (select locations), available exclusively through the industry- leading Hilton Honors mobile app. Homewood Suites is focused on guest satisfaction and stands behind each stay with its 100% Suite Assurance® guarantee. For more information on the extended- stay advantage, visit www.homewoodsuites.com or newsroom.hilton.com/homewoodsuites, and connect with Homewood Suites on Facebook, Twitter, LinkedIn, and Instagram. About Lafrance Hospitality Originating in 1955, Lafrance Hospitality Company, headquartered in Westport, MA, is a multifaceted organization that owns and operates fourteen hotels throughout New England and Florida, six function facilities, four restaurants and a catering division. In addition, Lafrance Hospitality Company offers restaurant and hotel management and consulting services as well as distressed asset management. Their vision is to be the premier hospitality company by employing the very best people, trained and empowered, to deliver a quality product with sensational service to every guest, every time. For more information on Lafrance Hospitality, visit lafrancehospitality.com.